This is probably the most important book on CFS/ME that I've read and produces some of the most compelling and logical causes and an understanding of the symptoms from an angle overlooked by most in the medical profession. This book contains a mix of information about M.E. and about 'CFS. 'Only a very tiny part even possibly relates to M.E.Mixing the two is very problematic but even so parts of the book could be considered useful reading to some extent for patients with M.E. (The books by Dr Hyde are far superior however, in every way. 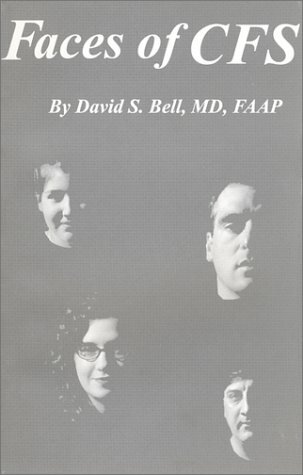 )This book looks at a small number of case studies of the illness, all patients of Dr Bell. There is some interesting information here, and also much which is irrelevant and also a small amount which is quite disturbing (concerning exercise, as I recall).Anyone that can talk up exercise to help those diagnosed with 'CFS' is part of the problem not the solution, sadly.This was an interesting read, but didn't really add much to my state of knowledge. The most interesting topic was the idea of blood transfusions maybe helping patients with reduced circulating blood volume. If you can read it for free online, it may be worth your time but otherwise I couldn't recommend it.I also would not choose this book to give to a family member or doctor to explain about M.E. as much of the general information given is muddied by 'fatigue' and CFS. It does not provide a good overview or a good discussion of the history of M.E. (as the title would suggest), and there are some very worrying statements made in the book you would not want to expose nasty 'disbelievers' to! Statements which could lead to serious abuse.This book may in part be about M.E. but only the most mild or maybe moderate cases. Dr Bell seems unaware of what severe M.E. is like.This may be a controversial statement, but in some ways Bell very much seems be getting further and further away from describing and discussing pure neurological M.E. as time goes on. More and more his work is muddied by 'fatigue' and by the bogus definitions of 'CFS' and does not relate to actual pure neurological M.E. whatsoever these days. When he says 'CFS' he should now refer solely to 'chronic fatigue'as this is what he is discussing. No distinct disease at all, including M.E.This book is good in parts, very bad in others. Politically it is terrible.What patients need to know politically is that:-----M.E. patients were treated appropriately and correctly diagnosed until around 1988, when there was an increase in the number of M.E. patients and outbreaks in the US. Some medical insurance companies (and others) decided that they would prefer not to lose many millions of dollars on so many new claims and so they created a new vague fictional disease category called 'Chronic Fatigue Syndrome' to try to confuse the issue of M.E. and to hide M.E. in plain sight.Under the cover of 'CFS' certain vested interest groups have assiduously attempted to obliterate recorded medical history of M.E. ; even though the existing evidence has been published in prestigious peer-reviewed journals around the world and spans over 70 years.M.E. is a distinct, scientifically verifiable and measurable, acute onset, organic neurological disease. 'CFS' in contrast, is not a distinct disease. 'CFS' doesn't exist. Every diagnosis of CFS - based on any of the CFS definitions - can only ever be a misdiagnosis. A watebasket diagnosis.The fact that a person qualifies for a diagnosis of 'CFS' (a) does not mean that the patient has M.E., and (b) does not mean that the patient has any other distinct illness named CFS.' M.E. and 'CFS' are not the same.Far fewer than 0.5% of the population has the distinct neurological disease known since 1956 as Myalgic Encephalomyelitis.Chronic Fatigue Syndrome is an artificial construct created in the US in 1988 for the benefit of various political and financial vested interest groups. It is a mere diagnosis of exclusion based on the presence of gradual or acute onset fatigue lasting 6 months. If tests show serious abnormalities, a person no longer qualifies for the diagnosis, as 'CFS' is 'medically unexplained.' A diagnosis of 'CFS' does not mean that a person has any distinct disease (including M.E.). According to the latest CDC estimates, 2.54% of the population qualify for a 'CFS' (mis)diagnosis.The patient population diagnosed with 'CFS' is made up of people with a vast array of unrelated illnesses, or with no detectable illness. However, while 'CFS' is not a genuine diagnosis, those given this misdiagnosis are in many cases significantly or even severely ill and disabled. 'CFS' is made up of people with cancer, MS, Lyme disease, depression and hundreds of other unrelated conditions.Sub-grouping different types of 'CFS,' refining the bogus 'CFS' definitions further or renaming 'CFS' with some variation on the term M.E. (such as 'ME/CFS') would achieve nothing and only create yet more confusion and help to continue and further entrench the mistreatment and abuse.The problem is not that 'CFS' patients are being mistreated as psychiatric patients; some of those patients misdiagnosed with CFS actually do have psychological illnesses. There is no such distinct disease/s as 'CFS' - that is the entire issue.Due to outrageous political influences on medicine and govermnent policy, the vast majority of M.E. patients will not be able to be correctly diagnosed with M.E. Most M.E. patients will unfortunately be misdiagnosed with 'CFS.' It is extremely important to note, however, that only a very tiny percentage of those told they have 'CFS' will be M.E. patients. The overwhelming majority of those misdiagnosed with 'CFS' do NOT have M.E. 'CFS' is NOT just another term for M.E.The name Myalgic Encephalomyelitis must be fully restored (to the exclusion of all others) and the World Health Organization classification of M.E. (as a distinct neurological disease) must be accepted and adhered to in all official documentations and government policy. M.E. patients must again be diagnosed with M.E. and treated appropriately for M.E. based on actual M.E. research. For this to happen, there is a real need for patients (and others) to participate in genuine advocacy and activism.The bogus disease category of 'CFS' must be abandoned. All those misdiagnosed with 'CFS' must immediately reject this harmful misdiagnosis and begin the search to find their correct diagnosis whether this be M.E., PVFS, depression, cancer, or any other disease. Correct diagnosis is vital in obtaining the correct treatment.Jodi Bassett, The Hummingbirds' Foundation for M.E.